This rich and fertile land produces some of Italy's finest foods and wine. 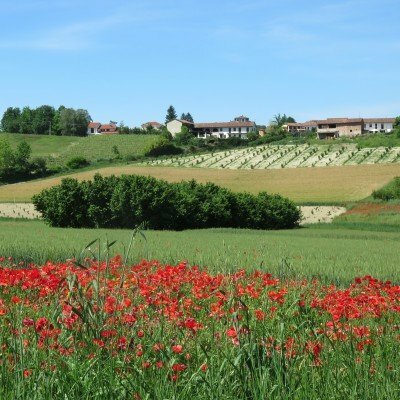 The region boasts an incredible array of wines, including robust Barolo, sweet Moscato and velvety Barbaresco. There are also plenty of gastronomic delights that you can try, including tangy cheeses, aromatic white truffles and crunchy hazelnuts. Following our walking or cycling route, you'll traverse world-famous vineyards and meet farmers carefully tending their grapes. Drink in breathtaking views of dramatic Alpine peaks that seem to float ethereally amongst the clouds as they encircle the quilted patchwork of vineyards, colourful splashes of sunflowers and lush hazelnut groves. 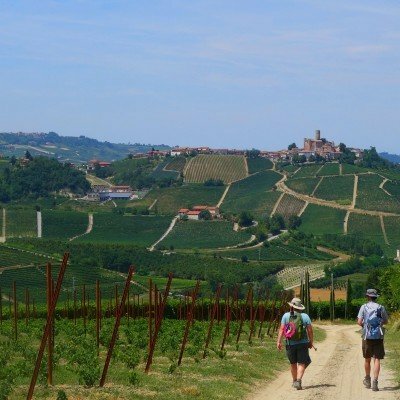 A gastronomic gem, tucked into Italy's north-western corner, the Langhe region of Piedmont is a glorious mix of gently rippling, waveshaped hills cloaked by layers of vines, sunflowers and oak forests, crowned with honey-hued hamlets and imposing Savoy castles. It's a wonderful region for exploring on a walking or cycling holiday.